Although goat production in Southeast Mexico rely on native vegetation, information regarding the potential of this grazing system for milk production is scarce. 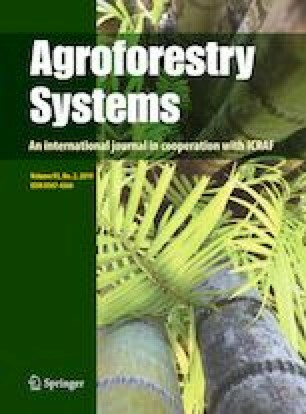 The objective of this study was to evaluate the productivity of lactating goats under three grazing systems: a grass monoculture system (GMS), an intensive silvopastoral system (ISPS) and a native vegetation system (NVS). Thirty Creole female goats (weight 41.7 ± 3.8 kg) from 2.5 to 3 years old and 60 days postpartum were randomly assigned to the three grazing systems. The availability and chemical composition of forage, milk production and composition, blood urea, body condition and live weight were assessed. In the NVS, goats consumed more than 60 different plant types, but their diet consisted mainly of 13 identified plant species. Although forage availability was lower for the NVS, the edible plants of this system had higher crude protein and lower fiber compared to the GMS and the ISPS. Consequently, milk yield in the NVS was similar (P > 0.05) to the other systems and, compared with the GMS, had a higher content of protein, fat, lactose and minerals (P < 0.0001). Edible plants from the NVS also had a higher content of tannins, which probably helped to modulate rumen NH3-N, as reflected in the lower blood urea concentration in that system (P < 0.01). Due to its higher forage availability, the GMS showed the highest milk production per unit area, followed by the ISPS and NVS. It is concluded that NVS, the most biodiverse and extensive grazing system, supplies good quality forage to support high quality milk production similar to ISPS. In addition, it is associated with a low ecological impact. We would like thank the owners farm of “Mi Viejo San Juan” farm for allowing us to use their facilities and their goats which enabled us to carry out this experiment. The first author is grateful to the National Council of Science and Technology of Mexico (CONACYT) for the research grant that supported the postgraduate studies at the University of Yucatan, Mexico.